A new content update is planned for Exam Master Onine on August 17, 2015. Please see below for a brief summary of materials impacted and explanations from Exam Master®. Questions? Comments? Email us at lib-hardin@uiowa.edu or call (319) 335-9151. Adding: Version 4 of Practice Exam, which incorporates the best questions from previous versions, along with new questions. Removing: Surgery (ACS) will be retired because Exam Master® has not been able acquire new content. 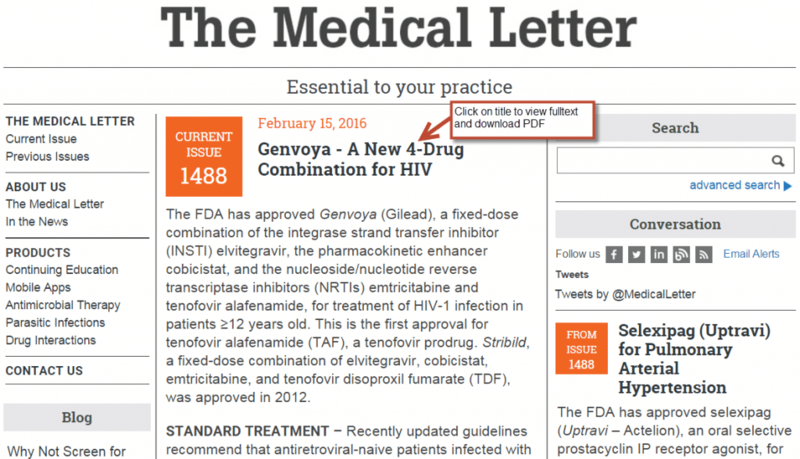 Updating: Family Medicine has been updated after a thorough review. 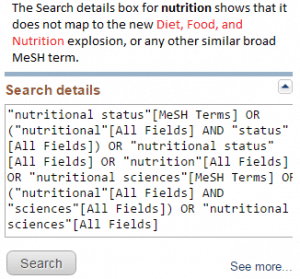 Adding: Biomedical Subjects and Clinical Subjects outlines. Exam Master Online can be found it on the Health Sciences Databases A-Z list on the home page for Hardin Library. Traditional scholarly metrics like Journal Impact Factors do not take into account scholars’ impact in today’s social media world. This is where altmetrics come in (visit altmetrics: a manifesto for more information). 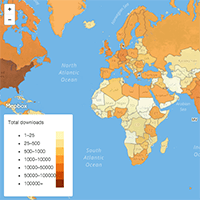 There are a growing number of altmetrics applications out there. 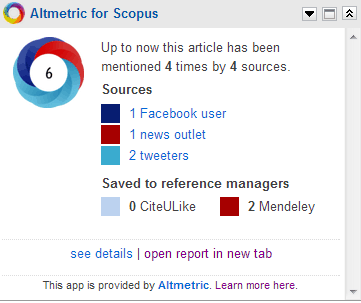 One example is the Altmetric for Scopus. Scopus is a multidisciplinary database with substantial international coverage. When you view an abstract in Scopus, you might see a box titled Altmetric for Scopus on the right side of the screen. 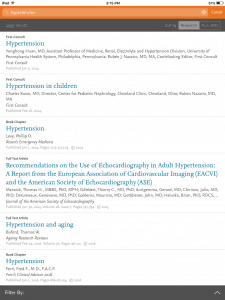 Below is a screenshot taken from the abstract view of the article: Slinin, Y., Paudel, M., Taylor, B. C., Ishani, A., Rossom, R., Yaffe, K., . . . Ensrud, K. E. (2012). Association between serum 25(OH) vitamin D and the risk of cognitive decline in older women. 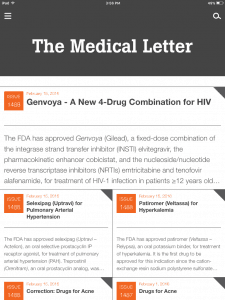 Journals of Gerontology – Series A Biological Sciences and Medical Sciences, 67 A(10), 1092-1098. It should be noted that Scopus is not compatible with Internet Explorer (IE) 9 (like ProQuest Dissertations and Theses). IE 9 users should also make sure compatibility view mode is turned on: go to Tools and then click on Compatibility View settings and check Display all websites in Compatibility View. Altmetric for Scopus is a 3rd party web application that collects mentions on social media and news outlets and counts on popular reference managers for a particular paper. The number inside the colored circle is the Altmetric score for the article you’re viewing. 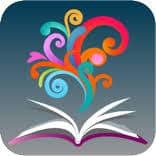 If you don’t see the Altmetric for Scopus, it means this app can’t find any mentions of the article you are viewing in their data sources. Also keep in mind that Altmetric only started collecting content from supported publishers/repositories during the second half of 2011. Read more on the app’s potential limits on its developer’s website. Come to Hardin Library on Tuesday, Feb 19th, 1:00-2:00 pm and learn more about Scopus. Register for the class at http://www.lib.uiowa.edu/hardin/workshop/ Don’t forget that we offer a class called “Get Started Publishing”. If you don’t see it listed, you can always contact us for a one on one or group consultation. 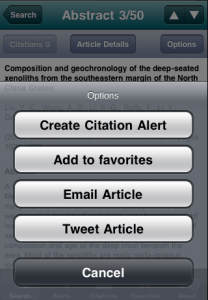 The Scopus Alert for iPhone app allows you to 1) do keyword search, 2) email, bookmark, and tweet an article, and 3) receive email alerts when articles get cited. Keep in mind that you can only view abstracts, and full-text links are NOT available. 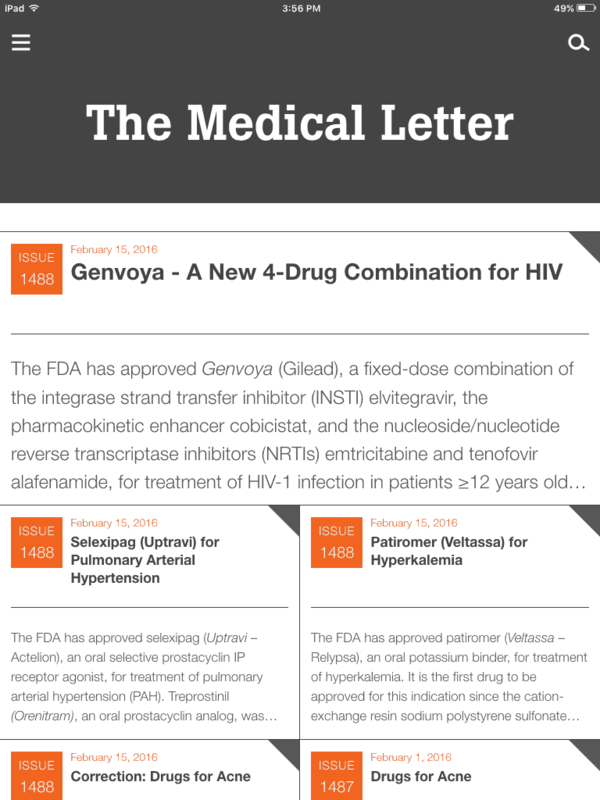 A workaround is to email an article to oneself and access the fulltext outside of the app. 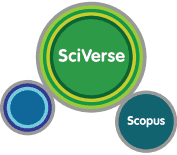 Before you download and install SciVerse Scopus Alerts (institutional subscriber’s version) from the App Store on your iPhone, you need to create a Scopus account at http://purl.lib.uiowa.edu/scopus. 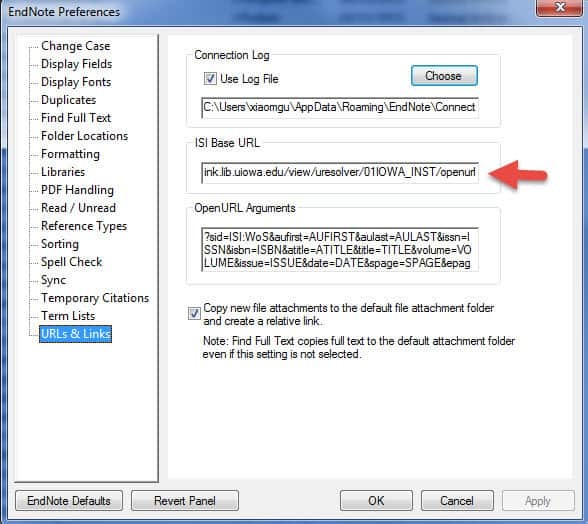 You will be prompted to enter your Scopus log in and password and your UIowa email when you first open this app. 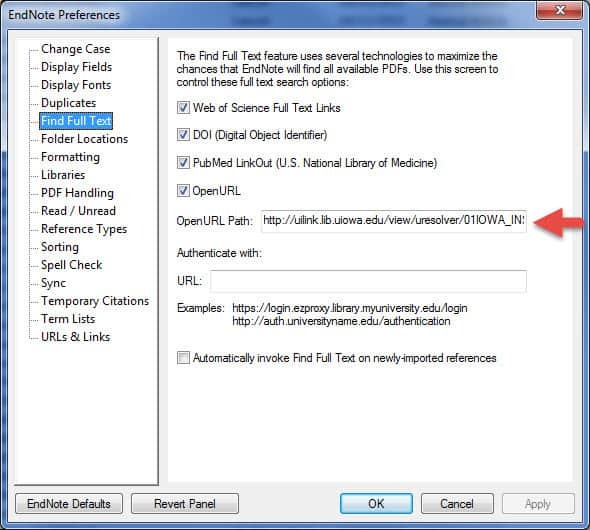 Detailed instruction can be found at SciVerse Scopus iPhone app User Guide (PDF file). 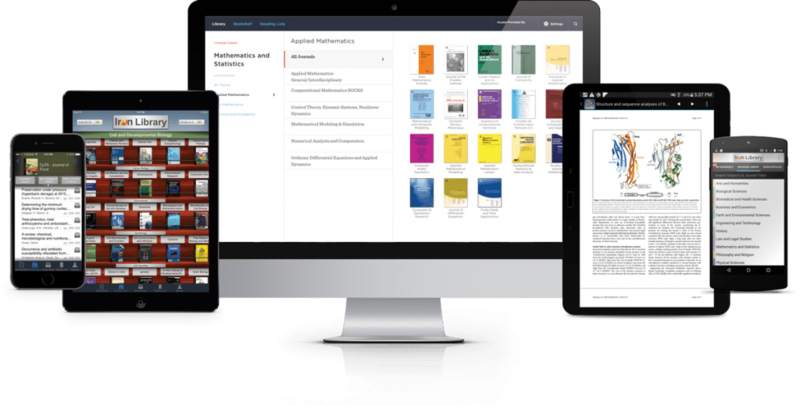 Scopus is a multidisciplinary database with substantial international coverage. All citations that are in EMBASE are also in Scopus. 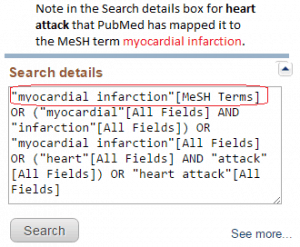 Scopus also allows you to measure an author’s scholarly impact and to track an article’s cited and citing references. Come to Hardin Library on Tuesday, Feb 19th, 1:00-2:00 pm and learn more about Scopus. Register for the class at http://www.lib.uiowa.edu/hardin/workshop/.